A longtime if largely unseen resident of Valley Center, J.J. Cale is also one of the most influential artists of the first generation of rock stars. A man whose laconic vocal style is cited by both Eric Clapton and Mark Knopfler as an imiportant influence, he also wrote two of the biggest hits of Clapton's career in "After Midnight" and "Cocaine," as well as "Call Me the Breeze" which Lynyrd Skynyrd scored with. Nine months after the release of he and Clapton's first collaboration, "Road to Escondido," Time Life Records has released a collection of outtakes from Cale's recording sessions from the early 1970s to the mid-'80s. These are songs that were prepared for various albums during that time period but, for whatever reason, never made the final songlist. And listening to this album, it's hard to see in hindsight why they weren't included, as they are among his strongest performances on tape. 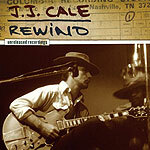 What sets many of them apart from what was released, though, is the fact that so many of the 14 songs here are covers  and Cale's albums are almost all comprised of his own compositions. Covers here of Waylon Jennings' "Waymore's Blues," Randy Newman's "Rollin'," Leon Russell's "My Cricket" and Clapton's "Golden Ring" show Cale as a first-rate interpreter of other's songs. Still, even his own songs here, previouslyl unheard, are among the best he's ever written and recorded. "Guess I Lose," apparently cut during the sessions for his 1979 release, "5," is built around his signature loping boogie beat and subdued vocals with one of those patented melodic hooks of his that just grab your ear and won't let go. "My Baby and Me" is just as good, as are a couple more. Fact is, there's no bad track here  just some of the best country-rock of the 1970s and '80s that, for whatever reason, we never got to hear before. And that's quite the treat in 2007.